The Timeline adds more power to the sculpting and painting processes. One of the main purposes is to allow you to create better presentations of your 3D models or work with more accuracy on your Morphs and Blend Shapes by being able to animate them. The Timeline feature also lets you animate several elements, from the camera position to 3D layers, ZSpheres and more. Before working on an animation or just storing information through key frames, you must enable the Timeline. To do so, go to the Movie Palette and in the Timeline sub-palette click on the Show button. The Timeline will appear at the top of your Document. Two lines which have the same width of the document, one with graduation and another one above it without. The one with graduation receives key frame manipulation points and can zoom in and out while the other one always displays the animation’s whole Timeline. On the left, the name of the active track is displayed. Under the Timeline, you can find the time cursor (scrubber), which will let you move forward and backward in time and which displays the number and time of the current frame. To create a new key frame, simply click anywhere on the Timeline. The time cursor will automatically be placed at this position. If you want to remove a key frame, click on it and drag it outside of the Timeline before release the mouse button. You can also click and drag a key in the Timeline to change its time position, making the event come sooner or later within your animation. Click and drag the time cursor to preview your animation. Please, read the next chapters for additional control over your animation. Load: Load a previously saved Timeline. Save: Save the current Timeline. It can be useful when working with different iterations of an animation by avoiding the need to save extra data like all the 3D models. Note: When saving a Project (see the project chapter), the Timeline is also saved. Show: Show or hide the Timeline on the top of the Document. Note: This option state is saved in a Project file. Export Name (save as MDD): When clicking on this button, a system window will appear for saving an MDD file. This file saves all the vertex animation information that was created by recording a movie. MDD files can be edited in other 3D software (some packages require a plugin) and can also be reloaded by ZBrush in a new 3D layer to play the saved animation as a loop. Go Previous & Next: Press these buttons to move from one key to another. You can also skip to the beginning or the end of the Timeline by double-clicking one of these two buttons. Hotkeys : Arrow left and Arrow right. Timeline Magnification slider: Sets the amount of magnification of the Timeline when a selected key is clicked. Auto mode: When enabled, this mode will automatically set the optimum value for the magnification of the Timeline and won’t use the Timeline magnification slider value (see above). Load Audio: When pressing this button, a system dialog box will open, asking you to select an audio file. The mp3, aiff, sd2, amr, aac, 3gp m4a and wave file formats are supported. The length of the Timeline will be resized to the length to the audio track. Please refer to the Set/Remove audio beats section for more information. Remove Audio: removes the existing audio track. Duration Slider: Use this slider to define the length of your animation in seconds. If an audio file is loaded, the Timeline Duration value will be set to the length of your audio track. At any time, you can play your animation by pressing Shift and clicking on the time cursor. Based on the complexity of the scene, ZBrush will do its best to display all frames but will skip frames if necessary. The animation will loop until you stop it by clicking on an element of the Timeline or in the Document. Note: To preview all movie frames you must do the record action (see below), which will always play all frames of the animation without skipping any. Press Shift and move your mouse cursor over either end of the track to pan the Timeline. Click on a selected key to magnify the Timeline. Click again on a selected key to zoom out. 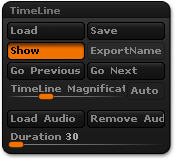 The magnification factor is defined by the Timline Magnification slider located in the Movie >> Timeline menu. When creating your animation, ZBrush will automatically select the Timeline track corresponding to your action: if you are manipulating a layer setting, the Layer track corresponding to the active layer will be enabled. Whenever empty space in the canvas is clicked the track will be switched to Camera. If you want to manually select the track of your choice, go in the Movie >> Timeline Tracks menu. In the Edit section, click on the track you want to choose. ZBrush will display this track’s content, letting you edit it as needed. Please read the Different Tracks of ZBrush chapter for more information on these tracks and their purpose. ZBrush can only work with one active track at a time. When selecting a new track, the previous track’s contents are displayed as light grey dots. This lets you see where the key frames of the previous track are located. The animation keys can be selected or not: The selected key is always plain orange in color while the unselected keys are represented by an outlined orange circle. To create a new key, click in an empty part of the Timeline. The new key will be represented by an orange circle at the location of your click. To select a key, simply click on it. The outlined orange circle will switch to a plain orange one. To delete a key or a selection of multiple keys, move the selected key off the track with a simple click and drag. To select multiple keys, click on the first key to select it. With Shift pressed, click on any other keys to select them. It is only possible to select the keys which are adjacent to the current selection. To select a range of keys, select the first one, hold Shift and select the last one. All the keys between these two selected keys will be selected as well. To move keys, first select the keys to move, then click and drag one of the keys along the Timeline track. Moving keys can work with a single key or a selection of multiple keys. To duplicate a key or several keys, you must first select it/them. Move the Time cursor to the location you want to copy the key(s), then hold the Shift key and click in the Timeline. A confirmation message will ask you for approval. Validate to create the copy of the selected keys. To replace the content of a key frame (like a new position for the camera), first set your new position then press CTRL+Shift and click on the key frame of your choice. The previous information will be deleted and replaced by the new data. To create a cut in your animation, you can insert a specific Cut key which will, when played, stop all animation in the selected track until the next key frame is reached. This allows you to set a new behavior for your animation without the need for external video editing software. To create a Cut key, first create your animation by using standard keys. Then if you need to do a cut, press Ctrl/Command Key and click on the key of your choice. Its appearance will change from a circle to a square. When your animation is played and the time cursor reaches this cut key, the animated actions will stop until the time cursor reaches the next key. Depending of the number of frames before the next key, you can create long pauses or short ones. To create an Ease In and Ease Out in the Timeline, you will need to create a key frame between two existing Key frames. Ctrl+click on the new key frame to turn that into a circular arrow icon. Add another key frame between this new circular key frame and the next key frame. Ctrl+click on this new key frame so that you will have four key frames total with the first and last keys solid orange and the two keys in between being circular. Moving the first circular key frame closer to the solid key frame will create a slower ease in and the second circular key frame distance from the fourth key frame will control the ease out. The further you have the second circular key frame from the fourth key frame, the faster the ease out will be. Note: If you only create one circular key frame between two solid key frames then ZBrush will automatically use the location of the circular key frame as the end of the ease in and beginning of the ease out. To select and work on a track of your choice, go in the Movie >> Timeline Tracks menu and while in Edit mode, activate the desired track. If you wish to protect a certain track from editing, you can temporarily disable it by going in the Enable section of the Timeline Tracks menu and disabling the track(s) of your choice. Timeline tracks are linked together to be on the Camera Track. 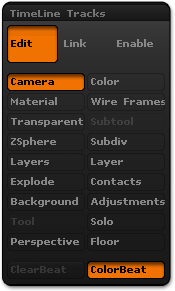 By default ZBrush has Tool and Subtool linked to the Camera Track. In this way, you can organize and work on several elements at the same time in one track. This is useful when you need to create simple animations which include different elements. ZBrush automatically swaps from one track to another when the corresponding content is selected in ZBrush. For example, activating a layer will turn on and switch to the Layer track. The Camera track is the default track. Some tracks may be disabled in the list of available tracks if the corresponding element doesn’t exist. This track is dedicated to animation of Move, Scale and/or Rotate of the selected Tool or SubTool, similar to a camera animation. Note that the Timeline does not create cameras; just like with sculpting, you are moving the scene element in front of the camera rather than moving the camera relative to the scene. This track is dedicated to animation of the color applied to the selected Tool or SubTool. Change the main color value in the Color palette and store it with key frames to create a color animation. PolyPaint can’t be animated (although the visibility of PolyPainted layers can be using a Layer track). The Color track only works with Tools or SubTools that have not had PolyPaint applied to them. This track is dedicated to animation of the selection of Material. The material modifiers can’t be animated. No transition between two MatCaps is possible. Material can be animated only through a transition type key frame. This track is dedicated to animation of the Polyframe of the selected Tool or SubTool, through its visibility and its settings located in the Preferences >> Draw menu. This track is dedicated to animation of the Transparency of the selected Tool or SubTool by toggling the Transparent mode and / or Ghost mode and the corresponding settings located in the Preferences >> Draw menu. This track is dedicated to animation of SubTool visibility, by clicking on the eye icon in the Tool >> Subtool menu. The ZSphere track controls the ZSphere Preview mode, allowing it to be toggled on and off. (This is because you might want to demonstrate how you had created the model/rig). For animating ZSpheres use their 3D Layers. This gives you a lot of control because you can have several layers acting independently, copy keyframes and so on. This track is dedicated to animation of the Subdivision levels of the current Tool or SubTool by changing the Subdivision level slider located in the Tool >> Geometry menu. This track is dedicated to the simultaneous animation of all 3D layers at once for the current Tool or SubTool, by changing their visibility and/or intensity. Changing the visibility is done by setting the intensity slider to 0 (hidden) or 1 (fully visible). Different from the Layers track, each Layer track is dedicated to animation of the selected layer of the current Tool or SubTool. In other words, each layer of the 3D model can have its own animation track. Changing the visibility is equivalent to setting the intensity slider to 0 (hidden) or 1 (fully visible). Note: Take the time to name your layers when creating them as the layer’s title will be displayed in the Timeline, helping you to know which layer is currently animated. This track is dedicated to animation of the Explode function and its Amount slider, both found in the Transform Palette. Note: Depending on the number of SubTools and the total polygon count, the Explode animation may not visible in real-time when playing an animation. It will normally only be fully visible with no dropped frames when recording the animation. This track is dedicated to animation of the Contact function and its settings, found in the Tool Palette. It allows you to change the contact information during your animation. This track is dedicated to animation of the canvas background settings, found in the Document palette. You can change the gradient range, center, rate and color settings. This track is dedicated to animation of the document Adjustments settings which are available in the Render >> Adjustment menu. This track is dedicated to animation of the loaded tools, like swapping from one tool to another during the animation. This track is dedicated to animation of the Solo mode, temporarily isolating the current SubTool and hiding all other SubTools. This track is dedicated to animation of perspective mode and its settings, located in the Draw palette. This track is dedicated to animation of the Floor settings. The Floor can be hidden or shown by animating the Floor visibility mode. You can also animate adjustments to the Floor settings located in the Draw palette: Elevation, Grid Color, Opacity, Grid size, Tiles and Axis color order. While creating your ZBrush animation, you may need to work with an audio track. It can help create a better presentation, or can be used to synchronize your animation with your audio when working on lip-sync, checking morph targets/blend shapes and more. ZBrush can recognize with these audio file formats: SD2, AMR, AAC, 3GP, AAC, M4A, AIFF and WAV. When loading an audio file, the Timeline duration is automatically synchronized to correspond to the length of the audio track. If the Timeline is not enabled, enabled it in the Movie >> Timeline menu by pressing the Show button. In this same palette, click on the Load Audio button. A system dialog box will ask you to select an audio file. Don’t forget to first specify the desired audio format. When working with your animation and audio track, you can create audio beat marks in your Timeline which will help you visualize the important parts of your animation and ensure that your animation will be synchronized to the audio. These marks can be created in any color, providing more flexibility in your marks creation. Colored beats are an excellent way to separate different parts of your audio. Use the Color palette to select the color of your choice for the markers. Start playing your animation by Shift+clicking on the Timeline cursor. While listening the audio, hold Ctrl and click in the Timeline to create an audio beat mark. Note: You don’t need to put your cursor on the location of the marker. You only need to Ctrl+click anywhere within the Timeline when you hear a beat. The mark will automatically appear at the correct point along the Timeline that corresponds with the timing of your Ctrl+click. You can remove the created Audio Beat markers by clicking on the Clear Beat button, located in the Movie >> Tilmeline Tracks menu. To the left of this button you have the Color Beat switch, which is turned on by default. Disable it to create Audio Beats markers without colors. To record an animation, Press Ctrl and Shift at the same time and click on the Time cursor. ZBrush will play all animation frames, recording them as a movie stored in memory. At any time, play the movie by clicking on the Play movie button, located at the top of the Movie palette. When playing a movie, ZBrush will use post-process compositing to add the Overlay image and Title image according to the settings located in the Movie palette menus of the same name. You don’t need to re-record the movie to change these settings. Instead, you can adjust them and then visualize the result by clicking on the Play Movie button. You can mix your animation with the original way of creating movies in ZBrush 3. So Timeline animation can be combined with using the Turntable tools or just clicking the Record button in the Movie palette and manipulating the canvas freely. If you wish to record a movie in Best Render or with BPR you will need to render first before Ctrl+Shift+clicking on the Time Cursor. Each frame will then be rendered until the animation is complete. Please keep in mind that depending on your settings, hardware and the complexity of the scene this can take quite a while. ZBrush lets you save and record a movie in its own format, the ZMovie (.zmv). You can open a previously created movie at any time, even if the Tools used to create this movie are not loaded. After recording your animation you can also export it as a Quicktime movie. When pressing the Export button, located in the Movie palette, a system dialog box will prompt you to choose a filename. When done, a Quicktime dialog box will ask you for the compression codec and quality. After a few seconds or minutes for conversion, your animation will be exported, ready to be played on your computer or uploaded online.